Smith Sheet Metal, located in Springfield Oregon, has specialized in all aspects of architectural sheet metal and custom metal fabrication since 1983. Smith Sheet Metal is a locally-owned and operated business that prides itself in performing quality work. 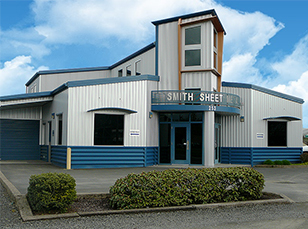 Whether functioning as a general contractor throughout Oregon or as a dependable subcontractor to local and national commercial contractors you can rely on Smith Sheet Metal to exceed customer expectations. We are a full-service commercial and residential sheet metal company with a well-maintained state-of-the-art computerized shop facility. As a leader in our industry, we strive to perform every project accurately, in a timely manner, and with the highest quality standards. Smith Sheet Metal is fully bonded, licensed, insured and has earned an excellent reputation for quality craftsmanship and customer service.